If your property in Camberwell needs the magical touch of a professional painter, contact Jim’s Professional Painting Camberwell, today. Jim’s Professional Painters are some of the best in Australia. Our work is guaranteed to make your property stand out, stand tall and stand proud. By choosing Jim’s Professional Painting Camberwell you are guaranteed to receive the highest quality finish and unrivalled customer service to match. Camberwell is a long established, prestigious suburb in Melbourne’s east. Jim’s Professional Painting understand Camberwell’s unique heritage. So, whether you are lucky enough to own one of the fine period homes, or a new modern townhouse, rest assured that we have the know-how to transform your property to reflect Camberwell’s impressive ambiance. Why Jim’s Professional Painting Camberwell is important for your next project. No matter how big or small the painting job, or whether it’s a home or business; if you have a project on the go, you can’t go past hiring a professional. In today’s busy world, who has the time to tackle their own painting job? The preparation for painting alone can take up a lot of time, and that’s even before you get the paint brushes out. Let’s not forget the amount of time it takes to gather all the right equipment for the job, the brushes, rollers, ladders, drop sheets, paint and anything else that might be needed. Do you have the expertise to know which painting products are best suited for your project? Are you aware of which methods will give you the best longest lasting results? These questions and more need to be considered before you decide to tackle DIY painting. Why waste your precious weekends trying to be an expert painter. Call the professionals, Jim’s Professional Painting Camberwell and let them take away all the hassles from your next painting job. Your home or business is important. Why chance it to inferior painting products? Jim’s Professional Painting Camberwell is synonymous with quality. We use only the highest quality products, equipment and methods. We guarantee our work will meet and exceed your expectations. High quality products combined with the expertise and skills of Jim’s Professional Painters result in a finish you’ll be proud to show off. Painting your house or business premises can be stressful, tiring and back-breaking. Jim’s Professional Painting Camberwell make the entire painting process quick and easy. It starts with the quote. Our quote is transparent and easy to understand. You know exactly what you are paying for. 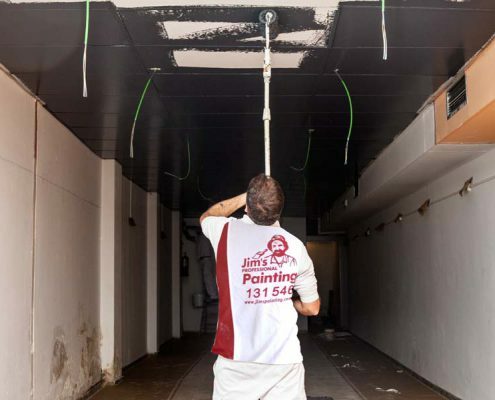 Your Jim’s Professional Painter will come armed with all the specialised equipment and products needed for your specific job. Feel safe and secure knowing they are masters of their craft. With years of experience, they have seen and handled it all. They are highly skilled perfectionists, with a keen eye for detail who strive to achieve the best results possible. After all, if you’re happy, you’ll tell your friends and we’ll be happy. To top it all off, Jim’s Professional Painting Camberwell appreciate the importance of deadlines. With us, you’re painting project will be finished on time. Overall, an easy, hassle-free process for you! If you’ve answered ‘Yes’ to the three questions above, Jim’s Professional Painting Camberwell is for you. Call us today on 131 546 for an obligation free quote.